On April 10, 2010, four-year-old A.J. Newman was killed just steps from his home. Along with his mother and two sisters, he was trying to get back to his apartment building from a bus stop on the far side of a five-lane highway. As they waited on a narrow concrete median, A.J. broke loose from Raquel Nelson’s hand, following the lead of his older sister, who took advantage of a short break in traffic to dash across the road. A drunk driver struck him dead before his mother’s eyes. Raquel Nelson’s troubles didn’t end there. In the wake of her son’s death, she was charged with vehicular homicide because, with three young children and an armful of groceries, she chose not to walk a third of a mile to the nearest marked crosswalk. A jury whose members never ride local buses found Nelson guilty of a crime whose true perpetrators were poverty and traffic engineering. She nearly went to jail, but after a national outcry, the judge reversed her conviction. She ultimately paid a $200 fine for jaywalking. The death of another young black man this summer has made the setting of these events familiar. Like Ferguson, Missouri, the run-down corner of Cobb County, Georgia, where A.J. Newman was killed is a declining inner suburb. When created in the middle years of the last century, these were places for middle-class white homeowners to get away from urban poverty. Their builders envisioned an endless future of affluent isolation. Circumstances have changed, but landscape and governance endure, bequeathing a legacy of institutionalized injustice to today’s residents. When Michael Brown encountered officer Darren Wilson on August 9, 2014, his suburban environment disadvantaged him triply. It wasn’t just that he was poor and black. Like Raquel Nelson, he was using his two feet for transportation in a place designed to be traveled by car. Carless Ferguson residents often seek out rides to the convenience store a few blocks away, a neighbor of Brown’s told the New York Times, just to avoid police harassment. The pretext Darren Wilson used to stop Michael Brown was jaywalking, the same offense for which Raquel Nelson nearly went to jail. Jaywalking, as Peter Norton shows in his landmark history Fighting Traffic, is an invented crime. It was the product of a massive publicity campaign orchestrated by automobile companies and allied motoring interests in the 1920s. Ostensibly aimed to promote safety, the real purpose of this effort was to push pedestrians off the street so that cars would move faster and be easier to sell. Along with their invention of jaywalking, the automakers exerted a controlling influence over the nascent discipline of traffic engineering. Industry-funded experts denied that speed was to blame for an epidemic of pedestrian crashes. They designed new roadways with the overriding objective of moving cars faster. As the years went by, engineering practices evolved to place those on foot at ever-greater disadvantage. Sidewalks disappeared, first on residential streets and then on main roads. Suburbs laid out to funnel traffic onto main arteries sent anyone who walked on long detours. Street corners were reconfigured to promote high-speed turns by cars. Highways widened and signage moved overhead, inviting freeway-speed movement on local roads. Midway through the 1920s, car ownership was still largely confined to the rich, and the public saw pedestrians hit by motorists as victims of irresponsible behavior by a privileged elite. As car ownership spread to the masses, however, the class aspect of road design faded into the background. Seen through the windshield, the highway was a place where all were equal—even more so with the opening of the toll-free interstates in the 1960s and ‘70s. Not everyone could afford a car, of course, even at the peak of postwar mass prosperity. But in the mid-twentieth century, the walking poor were shielded from the worst effects of the new road designs. Urban decay meant that their homes were still concentrated in old city neighborhoods, where they walked on streets laid out before the advent of traffic engineering. Today’s suburban poor lack that scant protection. The full weight of ninety years of car-first engineering bears down as they make their way to and from decaying apartment complexes and aging tract houses. Long walks to the main road, unprotected dashes across wide highways, and perilous waits at bus stops on unpaved shoulders are a daily routine. A landscape created for affluent motorists becomes an oppressive burden in its decline. In wealthier areas, street designs have begun to change. Roadways where it’s hard to walk bother city-dwellers. Even worse, they impede real estate development: under prevalent engineering standards, new construction cannot reproduce the inviting, narrow streets of the old urban neighborhoods homebuyers covet. Cities like New York, Washington, and Chicago, where people of all economic classes share the sidewalks, are starting to reclaim pavement once abandoned to fast-moving vehicles. But elsewhere, especially in poorer suburbs, the automobile still rules the road. Beneath a veneer of scientific neutrality, traffic engineering operates to the prejudice of anyone on foot. The objective is to move motor vehicles; those who walk, whether they do so by choice or by necessity, are little more than obstacles. Dissidents within the traffic engineering profession have begun to challenge this philosophy, but innovation, even when it revives the practices of a century ago, encounters fierce resistance from highway traditionalists. An elaborate body of doctrine maintains and justifies the status quo. Federal Highway Administration manuals lay out hundreds of pages of specifications that engineers rigidly apply. State highway bureaucrats, strongly inclined to maintain the primacy of automobile movement, dominate the committees that write these documents. The highway agencies, which can reallocate street construction funds and squeeze businesses seeking access to the roadway, have vast leverage over local politicians who might challenge them. Backing them up when needed is the political clout of auto and trucking interests. Hence the perilous highway crossing imposed on Raquel Nelson and her children. The builders of a five-lane road with a speed limit of 45 miles per hour did not furnish her bus stop with a traffic light or even mark a crosswalk with stripes on the pavement. Why such conditions are not just tolerated but actually mandated deserves a closer look. The rules for pedestrian crossings nationwide are set out in the Manual of Uniform Traffic Control Devices, known to specialists as the MUTCD. Chapter 4C specifies when red lights can be installed. One rule concerns vehicle traffic that approaches busy highways from a side street. It takes 240 cars in four hours to justify a traffic signal. Even then, no signal is allowed if there is another light within 300 feet. This distance is considered a short enough detour to impose on pedestrians, even though, at a steady pace, a 600-foot round trip on foot takes two-and-a-half minutes. Drivers’ time is valued quite differently: engineers classify an intersection as “failing” if an average car is delayed in rush hour by a minute twenty seconds. If pedestrians don’t use the crossing because it is unsafe, moreover, no light may be installed. Determining where to install traffic lights by counting people who step onto a dangerous highway, critics point out, is like deciding whether a bridge is needed by observing how many people swim across the river. Absent a traffic light, might Cobb County at least paint simple crosswalk stripes at the Nelsons’ bus stop? No, it may not. The 2009 revision of the MUTCD banned new crosswalk markings on roads where heavy traffic moves faster than 40 miles per hour—just the sort of environment where the only people likely to walk are those who cannot afford a car. The ostensible rationale for this edict rests on a little known and less enforced provision of traffic law. In most states, a pedestrian crossing the road at an intersection with no traffic signal always has the right of way, whether or not there are stripes on the pavement. Pedestrians, therefore, should need no help getting across the street. In theory, markings exist only to prevent collisions by warning drivers of the need to stop. But in a massive federal study, researchers observed that, in practice, “very few motorists stopped or yielded to pedestrians either before or after marked crosswalks were installed” at intersections with no traffic light. This much, surely, was already obvious to anyone who’s ever navigated the suburbs on foot. But the study’s conclusion was somewhat more surprising: on roads with four or more lanes, pedestrians were more likely to be hit by drivers in a marked crosswalk than when crossing at a corner without crosswalk markings. There were many possible explanations for this finding. Engineers, trying to minimize congestion, often put stripes where pedestrians will interfere least with car traffic. On occasion, public pressure gets crosswalk markings at particularly dangerous points. In either case, pedestrians concerned for their own safety might well select crossing points safer than those chosen for them by others. But the investigators ignored such possibilities and seized on a more congenial interpretation, one that reinforced traffic engineers’ long-standing dislike of crosswalk markings. They concluded that the absence of stripes makes it safer to walk across wide roads. Not only does this defy common sense, but the highway officials’ own behavior contradicts it. Their safety campaigns never advise pedestrians to avoid striped crosswalks and cross at unmarked intersections. 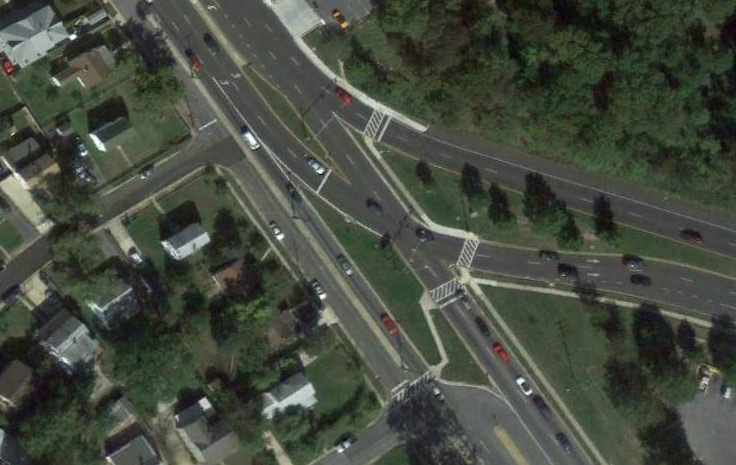 Only a traffic engineer could think this is the best way to cross East-West Highway in Chillum, Maryland. A driver killed a pedestrian here last month, and there was a critical injury in 2012. Google Earth photo. By banning pavement stripes, the revised 2009 MUTCD did more than make it harder to get to the other side of the road. Those who step onto unstriped asphalt lose in practice what meager protection the law by its letter affords. Outside a marked crosswalk, police are more likely to ticket the pedestrian who has the legal right of way than the driver who fails to yield. In collisions, officers and courts absolve motorists of blame unless they are drunk or flee the scene. The victim, held to have caused the crash by jaywalking, has little chance of collecting from the driver’s insurance. The edict against marked crosswalks did not go through without controversy, and advocates of walking won a concession. The MUTCD still allows the stripes at locations where twenty people an hour already cross, if special pushbutton-operated flashing lights are placed overhead. New crossings with these signals are starting to appear here and there, but they are vanishingly rare in the declining inner suburbs where the need is greatest. Even when cash-strapped local governments can afford the cost—the installations run some $100,000 each—people too poor to own cars rarely have enough political clout to overcome the traffic engineers’ resistance. A secure walk across the street, something that should be taken for granted anywhere, has been made into a luxury good. To be sure, the case of four-year-old A.J. Newman did prompt Georgia authorities to action. Within months, officials examined the site of the crash. Nothing could be done, they said, because there wasn’t enough money for a flashing light. But the state transportation department, like many such agencies, is slowly growing more attentive to those on foot. In May 2013, it had a sixteen-person team reexamine the entire highway. The study concluded that the bus stop should move a short distance for better visibility and its users should be helped across the road with pavement stripes, pushbutton, and flashing light. This recommendation has not yet been carried out. Almost five years after A.J. Newman’s passing, there is still no marked crosswalk where he died. Benjamin Ross is a transit activist in Maryland. His new book, Dead End, is about the politics of urbanism and transit. *Correction: This article previously stated that, in the MUTCD, a pedestrian counts for “just under three-fifths” or a driver. But a (reformist) traffic engineer points out a section of the MUTCD that allows a red light for 300 pedestrians under conditions similar to the conditions that allow them for 240 cars. A pedestrian counts, for this purpose, as four-fifths of a driver rather than three-fifths. We regret the error.